Before it happened, I would have said slim. But since it happened, 100%. —Lawrence Fishburne, CSI, on the chances of being hit in the head by a tortoise dropped by a bird of prey. I know this is a tired topic, but I am unable to resist using this as an opportunity to slag off Stanley Fish’s idiotic attempt to equate “faith” in religion with “faith” in science. In both cases, we are talking about conditional probability, P(hypothesis | information ), which is read as “the probability of the hypothesis given the information”. I suppose that when the religious discuss “faith” in science, they are referring to the fact that something needs to go on the right side of the bar — all probabilities are conditional on something. But a crucial difference between religion and science is that the religious only put a couple of things on the right side: the words of a holy book (and don’t ask me why one should choose one book over another), or just the effects of some vaporous conversion experience which leaves all such probabilities as tautologies — god exists since I know god exists. For science, however, we get to condition our probabilities on, well, pretty much anything and everything. And the more we learn, the better it gets. OK, this is going to be a very long post. About something I don’t pretend to be expert in. But it is science, at least. A couple of weeks ago, Radio 4’s highbrow “In Our Time” tackled the so-called “Measurement Problem”. That is: quantum mechanics predicts probabilities, not definite outcomes. And yet we see a definite world. Whenever we look, a particle is in a particular place. A cat is either alive or dead, in Schrodinger’s infamous example. So, lots to explain in just setting up the problem, and even more in the various attempts so far to solve it (none quite satisfactory). This is especially difficult because the measurement problem is, I think, unique in physics: quantum mechanics appears to be completely true and experimentally verified, without contradiction so far. And yet it seems incomplete: the “problem” arises because the equations of quantum mechanics only provide a recipe for the calculations of probabilities, but doesn’t seem to explain what’s going on underneath. For that, we need to add a layer of interpretation on top. Melvyn Bragg had three physicists down to the BBC studios, each with his own idea of what that layer might look like. Unfortunately, the broadcast seemed to me a bit of a shambles: the first long explanation by Basil Hiley of Birkbeck of quantum mechanics used the terms “wavefunction” and “linear superposition” without even an attempt at a definition. Things got a bit better as Bragg tried to tease things out, but I can’t imagine the non-physicists that were left listening got much out of it. Hiley himself worked with David Bohm on one possible solution to the measurement problem, the so-called “Pilot Wave Theory” (another term which was used a few times without definition) in which quantum mechanics is actually a deterministic theory — the probabilities come about because there is information to which we do not — and in principle cannot — have access to about the locations and trajectories of particles. Roger Penrose proved to be remarkably positivist in his outlook: he didn’t like the other interpretations on offer simply because they make no predictions beyond standard quantum mechanics and are therefore untestable. (Others see this as a selling point for these interpretations, however — there is no contradiction with experiment!) To the extent I understand his position, Penrose himself prefers the idea that quantum mechanics is actually incomplete, and that when it is finally reconciled with General Relativity (in a Theory of Everything or otherwise), we will find that it actually does make specific, testable predictions. At bottom, these interpretations of quantum mechanics (aka solutions to the measurement problem) are trying to come to grips with the fact that quantum mechanics seems to be fundamentally about probability, rather than the way things actually are. And, as I’ve discussed elsewhere, time and time again, probability is about our states of knowledge, not the world. But we are justly uncomfortable with 70s-style “Tao-of-Physics” ideas that make silly links between consciousness and the world at large. But there is an interpretation that takes subjective probability seriously without resorting to the extravagance of many (very, very many) worlds. Chris Fuchs, along with his collaborators Carlton Caves and Ruediger Schack have pursued this idea with some success. Whereas the many-worlds interpretation requires a universe that seems far too full for me, the Bayesian interpretation is somewhat underdetermined: there is a level of being that is, literally unspeakable: there is no information to be had about the quantum realm beyond our experimental results. This is, as Fuchs points out, a very strong restriction on how we can assign probabilities to events in the world. But I admit some dissatisfaction at the explanatory power of the underlying physics at this point (discussed in some technical detail in a review by yet another Oxford philosopher of science, Christopher Timpson). In both the Bayesian and Many Worlds interpretations (at least in the modern versions of the latter), probability is supposed to be completely subjective, as it should be. But something still seems to be missing: probability assignments are, in fact, testable, using techniques such as Bayesian model selection. What does it mean, in the purely subjective interpretation, to be correct, or at least more correct? Sometimes, this is couched as David Lewis’ “principal principle” (it’s very hard to find a good distillation of this on the web, but here’s a try): there is something out there called “objective chance” and our subjective probabilities are meant to track it (I am not sure this is coherent, and even Lewis himself usually gave the example of a coin toss, in which there is nothing objective at all about the chance involved: if you know the initial conditions of the coin and the way it is flipped and caught, you can predict the outcome with certainty.) But something at least vaguely objective seems to be going on in quantum mechanics: more probable outcomes happen more often, at least for the probability assignments that physicists make given what we know about our experiments. This isn’t quite “objective chance” perhaps, but it’s not clear that there isn’t another layer of physics still to be understood. In today’s Sunday NY Times Magazine, there’s a long article by psychologist Steven Pinker, on “Personal Genomics”, the growing ability for individuals to get information about their genetic inheritance. He discusses the evolution of psychological traits versus intelligence, and highlights the complicated interaction amongst genes, and between genes and society. What should I make of the nonsensical news that I… have a “twofold risk of baldness”? … 40 percent of men with the C version of the rs2180439 SNP are bald, compared with 80 percent of men with the T version, and I have the T. But something strange happens when you take a number representing the proportion of people in a sample and apply it to a single individual…. Anyone who knows me can confirm that I’m not 80 percent bald, or even 80 percent likely to be bald; I’m 100 percent likely not to be bald. The most charitable interpretation of the number when applied to me is, “If you knew nothing else about me, your subjective confidence that I am bald, on a scale of 0 to 10, should be 8.” But that is a statement about your mental state, not my physical one. If you learned more clues about me (like seeing photographs of my father and grandfathers), that number would change, while not a hair on my head would be different. [Emphasis mine]. That “charitable interpretation” of the 80% likelihood to be bald is exactly Bayesian statistics (which I’ve talked about, possibly ad nauseum, before) : it’s the translation from some objective data about the world — the frequency of baldness in carriers of this gene — into a subjective statement about the top of Pinker’s head, in the absence of any other information. And that’s the point of probability: given enough of that objective data, scientists will come to agreement. 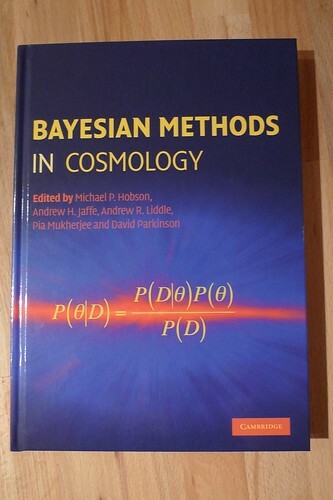 But even in the state of uncertainty that most scientists find themselves, Bayesian probability forces us to enumerate the assumptions (usually called “prior probabilities”) that enter into our assignments reasoning along with the data. Hence, if you knew Pinker, your prior probability is that he’s fully hirsute (perhaps not 100% if you allow for the possibility of hair extensions and toupees); but if you didn’t then you’d probably be willing to take 4:1 odds on a bet about his baldness — and you would lose to someone with more information. In science, of course, it usually isn’t about wagering, but just about coming to agreement about the state of the world: do the predictions of a theory fit the data, given the inevitable noise in our measurements, and the difficulty of working out the predictions of interesting theoretical ideas? In cosmology, this is particularly difficult: we can’t go out and do the equivalent of surveying a cross section of the population for their genes: we’ve got only one universe, and can only observe a small patch of it. So probabilities become even more subjective and difficult to tie uniquely to the data. Hence the information available to us on the very largest observable scales is scarce, and unlikely to improve much, despite tantalizing hints of data discrepant with our theories, such as the possibly mysterious alignment of patterns in the Cosmic Microwave Background on very large angles of the sky (discussed recently by Peter Coles here). Indeed, much of the data pointing to a possible problem was actually available from the COBE Satellite; results from the more recent and much more sensitive WMAP Satellite have only reinforced the original problems — we hope that the Planck Surveyor — to be launched in April! — will actually be able to shed light on the problem by providing genuinely new information about the polarization of the CMB on large scales to complement the temperature maps from COBE and WMAP. This gives the probability, P(n), that a team will score n goals in a given game, if the average number of goals they are expected to score is λ. Unfortunately, that’s the easy part; the hard part is figuring out that expected number, λ. We don’t just want to know the average number that, say, England scores in all the games it has ever played, but the average in circumstances like the World Cup: against Brazil and not, for example, Belarus (OK, that’s a bad example…). I was pleased to note that the article said that the company making these predictions, “Decision Technology,” uses “maximum likelihood estimation”, which is strongly related to the Bayesian Probability theory I wrote about a few weeks ago.